Anthony Joshua is set to defend his IBO, IBF, WBO and WBA heavyweight belts against Russia’s Alexander Povetkin in London come September 22. Joshua (21-0, 20 KOs) and Povetkin (34-1, 24 KOs) came face-to-face for the first time during the press conference held in New York on Tuesday. 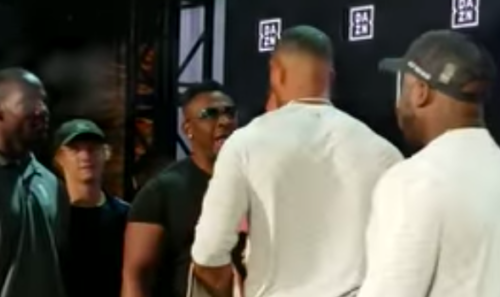 However, as the duo posed for the staredown, American prospect Jarrell Miller stormed at the stage and began a verbal tirade against Joshua. The 2012 Olympic champion was clearly not amused as he came nose-to-nose with Miller before his promoter Eddie Hearn and other officials separated them. A perplexed Povetkin, who is known for his calm demeanour, looked on. Miller (21-0, 18KOs), who is popularly known by his nickname ‘Big Baby’, has been calling out Joshua for a fight since quite some time. “Come to Brooklyn, AJ, and I’ll show you what’s really up,” Miller had previously said, inviting Joshua to make his debut in the United States. Should serve as an ideal run-up for Deontay Wilder unification, no?